The first earthwork I ever encountered was, ironically, in the heart of New York City. I made my way by subway and on foot to 141 Wooster Street in Soho. I climbed a narrow staircase and turned to see a work of art unlike anything I’d ever encountered: a gallery filled with dirt. The attendant told me the space was 3,600 square feet, the soil was 22 inches deep, and the weight of this natural material was 280,000 pounds. I couldn’t walk on it, but I could smell the earthy air and feel the humidity that kept the dirt a dark, rich brown. I took my time, inhaling deeply and looking intently, before turning and heading back to the city street. The New York Earth Room (1977) is a terrific introduction to Walter De Maria’s artistic practice. As a maker of earthworks or land art, he crafts experiences with and in nature that appear to be simple, but are often transcendent. Like the works of fellow land artists—Robert Smithson’s Spiral Jetty, Nancy Holt’s Sun Tunnels, and Michael Heizer’s Double Negative, to name a few—they are also conceptual and challenge the notion that art is a commodity that can be easily bought and sold. As part of the Postminimalist generation of the 1960s and 1970s, these artists focused on process and nontraditional materials, while they critiqued the commercialism of the New York art world. Seeing Earth Room in person made me want to leave the city and travel to see how De Maria work functioned in the American landscape, rather than the man-made environment of lower Manhattan. My next stop would be De Maria’s largest and most famous earthwork, The Lightning Field in New Mexico. My pilgrimage to The Lightning Field was considerably more arduous and time consuming. The closest town is Quemado, about two and a half hours southwest of Albuquerque. The drive takes you through the high desert of New Mexico. This area is flat but beautiful. The summer morning was chilly and sunny and my friends and I met our guide at the Dia Foundation office, a nearly empty building in a very sleepy town. We signed the guestbook, and eagerly piled into the big, dusty SUV that would take us to our destination. The route was hard to chart, as so many roads are unpaved and unmarked. I had trouble keeping track of the time as I watched for rattlesnakes, counted cattle, and searched for signs of De Maria’s installation. After what felt like only a moment, but must have been more than an hour, we pulled up to the edge of a large field of metal poles that look like sleek lightning rods. We unloaded our belongings and toured our overnight accommodations, a humble wooden cabin with a pellet stove for warmth and a pan of green chile enchiladas in the fridge for dinner. We found a binder in the cabin that contained basic information about the surveys and engineering studies that the project required and that lists many of its essential physical properties. The field measures one mile by one kilometer and the 400 poles range in height from 15 feet to 26 feet 9 inches, but because the seemingly flat terrain is actually quite uneven, their tips are so level that you could lay a sheet of glass atop them. It took roughly 38,000 pounds of stainless steel to make the poles and if you laid them down in a line, they would stretch a distance of more than one and a half miles. From the porch we could see many of the poles gleaming in the late-afternoon sun, but some in the distance were hard to spot. So we spent the remaining daylight hours roaming the field, getting lost, and finding our way back. When he announced The Lightning Field in the April 1980 issue of Artforum De Maria explained, “The invisible is real” and “Isolation is the essence of land art.” These are the statements that preoccupied us as we explored this work of art. The maximum number of visitors at any one time is six, and it is easy to venture so far out that you cannot see any of your companions. At twilight, I found myself on the far edge of the field, turned to look back at the steely gray poles and the cabin, and instead of seeing my friends, saw a pronghorn in my path. At sunrise, we all sipped coffee as we watched the poles reflect the pink and blue sky of the early morning. At midday, many of the poles seemed to disappear as the sun hit them from above and in the early afternoon the tips shone so brightly that they almost looked like burning candles. Around the clock, these man-made poles reminded us of nature’s ephemeral qualities and the poetry of consciously experiencing our surroundings. 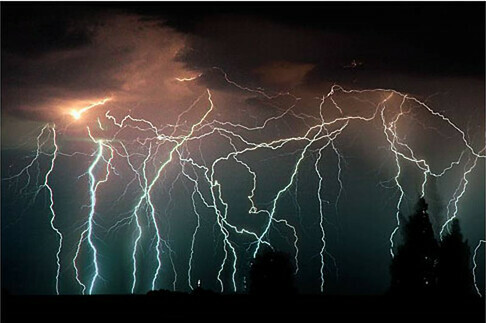 Of course, the title of this work teases you with the possibility of seeing lightning strike and dance atop the poles. This is possible. In fact, De Maria selected this part of New Mexico precisely because of the relatively high incidence of electrical storms. The likelihood increases in the summer, especially during the rainy months of July and August. But if you don’t see lightning, don’t fret. In my two trips to The Lightning Field I have managed to find that sublime landscape of the modern American West even without witnessing lightning. My experiences of The Lightning Field were not unlike the feeling I get when looking at a painting by Albert Bierstadt (below), Frederic Edwin Church, or Thomas Moran. All of these artists make me want to get outside and find a spot where the air is crisp and clean, where I feel alone and independent, and where I can think about big ideas. John Beardsley, “Art and Authoritarianism: Walter De Maria’s “Lightning Field”” October 16 (1981), pp. 35-38. Kenneth Baker, The Lightning Field (New Haven: Yale University Press, 2008. Suzaan Boettger, Earthworks: Art and the Landscape of the Sixties (Berkeley: University of California Press, 2002). Walter De Maria, “The Lightning Field: Some Facts, Notes, Data, Information, Statistics, and Statements,” Artforum 18, no. 8 (April 1980), p. 58. Cite this page as: Dr. Lara Kuykendall, "Walter De Maria, The Lightning Field," in Smarthistory, October 1, 2016, accessed April 21, 2019, https://smarthistory.org/walter-de-maria-the-lightning-field/.